What Day Of The Week Is August 23? 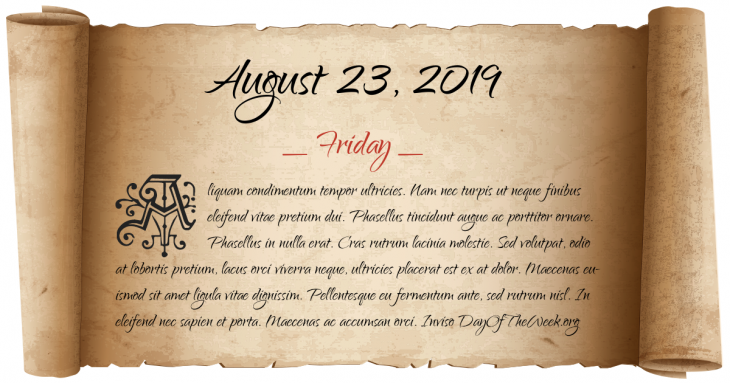 August 23, 2019 is the 235th day of the year 2019 in the Gregorian calendar. There are 130 days remaining until the end of the year. The day of the week is Friday. The Round Oak rail accident occurs in Brierley Hill in the Black Country, England. It is 'Arguably the worst disaster ever to occur on British railways'. Albert Bridge in Chelsea, London opened. World War I: Japan declares war on Germany and bombs Qingdao, China. English cricketer Len Hutton sets a world record for the highest individual Test innings of 364, during a Test match against Australia. World War II: Beginning of the Battle of Stalingrad. Who were born on August 23?